The Author of Hebrews – Why Not Paul? As I suggested in a previous post, one of the factors we have to consider for the authorship of Hebrews is that the author was influenced by Paul or Pauline theology. Perhaps the simplest way to account for this influence is simply that Paul is the author of the book of Hebrews. While this is not a popular view today, the earliest traditions identify Paul as the author, but this has been questioned since the Reformation and is now only rarely defended. Why was Paul suggested as an author? There may have been some desire to connect the letter with an apostle in order to argue in favor of including the letter in the canon. A document that came from the apostolic circle would carry more weight than a document that did not. In addition, there are some Pauline elements to the book. As the books of the New Testament we collected into book form (codices), Hebrews was often associated with the Pauline letters. The earliest copies from the third century place the book within the Pauline letter, right after Romans. Many early church fathers, especially the Alexandrian fathers, believed Paul wrote the book. Clement of Alexandria (150-215) and Origin (185-253), for example, believed Paul was the author. By the end of the second century, Origen thought that the “weight of tradition” was behind Pauline authorship, but in the end said “only God knows” who wrote the book. He goes on to say “This writing is inspired even though we do not know who wrote it.” (See Eusebius, HE 6.25.11-13). It was not until the Reformation that this teaching was doubted, first by Calvin, then by Luther. More recently, detailed linguistic analysis has been done my Celsus Spicq, who concluded that “it is impossible from the linguistic point of view to attribute to Paul the direct paternity of Hebrews” (Cited by Ellingworth, Hebrews, 12). Since the book is anonymous and there is a mixed tradition about who the author might have been, perhaps it is better to agree with Origen as say “only God knows” who wrote the book. David Allen Black has revived the Pauline authorship of Hebrews in a series of articles now summarized in a short book, The Authorship of Hebrews: The Cases For Paul (available for a mere$2.99 on Kindle). Black surveys the internal evidence for Pauline authorship by working through the book of Hebrews and showing potential parallels in Paul’s letters. Some of these are compelling; there are many words and phrases that appear only in Paul and Hebrews in the New Testament. But some of the parallels can be explained better as use of a common source. For example, In Hebrews 4:12-13, the Word of God is like a double-edged sword (μάχαιραν δίστομον), which Black says “seems to betray Paul (Eph 6:17). Certainly the word sword appears in both contexts, but in Paul it is the Sword of the Spirit, in Hebrews the Word of God is the sword. Paul omits the additional description of “double edged.” That word only appears in Hebrew 4:12 and three times in Revelation to describe a sword (although ῥομφαία is used, not μάχαιρα. In the end, there are parallels, but nothing that forces the reader to assume Pauline authorship. Another way to get the Pauline influence on the book of Hebrews is the suggestion that Luke used a synagogue sermon by Paul to write what we now know as the Book of Hebrews. This was the thesis of Andrew Pitts and Joshua Walker in an essay in Paul and His Social Relations (edited by Stanley E. Porter; Leiden: Brill, 2012). Pitts and Walker prefer to think of Luke as the editor of an oral presentation. In order to show this, they study ancient stenography and propose that it is at least possible that Paul is the source, Luke is the editor. This is an important essay since it avoids the objection that “linguistically” the book is not Pauline, while embracing the (at times) Pauline theology in the letter. I think that both of these attempts are worthy of consideration since they take seriously the Pauline influence on the book of Hebrews. Pitts and Walker make a compelling argument for transcription of a synagogue sermon, but it is harder to support the claim that Paul was the origin of that sermon. It seems to move the authorship issue back a step to “who was the original speaker of this sermon?” Paul, Apollos and the usual suspects are all still possible. The modern church is as bothered by an anonymous letter in the New Testament, but it may matter to some people that Paul did (or did not) write the book. What are the implications for reading the letter if Paul did (or did not) write the book? ← Who Wrote the Book of Hebrews? There are a few implications that would arise with believing that Paul did/didn’t write the book of Hebrews. 1. People could question the canonicity of the book. This doesn’t seem like a big deal at first but having a book in the Bible that no one knows who wrote it… How can we say it is inspired? How do we know that some lunatic didn’t write this book? I am not saying that this is what happened but just implications that would arise with the questioning of authorship. 2. If Paul did not write this book could we trust his word in other books that we know that he wrote? In 2 Thess.3:17 we see that Paul marks all of his writings, “I, Paul, write this greeting in my own hand, which is the distinguishing mark in all my letters. This is how I write.” So if Paul did write this book why would he have said this in Thessalonians 2? Why would Paul change his routine of marking his letters? Or maybe the guy just forgot to sign his name. 3. It effects the way we understand the book. When we read other N.T. books we know the author, location and many other details that help us understand the book in ways that help us live out our daily Christian lives. Not knowing the author of the book doesn’t effect our theology very much, if at all. To me it doesn’t effect the canonicity of the book either. But not knowing the author is life receiving a letter in the mail from someone that you have never met, or even heard of. The contents of the letter are amazing and are life changing, but who wrote it? It would be cool to know the person so that we can study their life and maybe other writings. The theology in Hebrews is amazing and well articulated, it would be beneficial to be able to know more about the author. The implications listed above are not my own implications but just possible implications that I think people could ask of the book and have asked. The way that Dan spelled out the different implications of pauline vs non-pauline authorship are good enough that i can’t really draw out implications without slightly plagiarizing his post. However what i would like to do is pick one and expand. To me not know the author of a book is a valid reason to question canonicity. While i 100% believe God could use any literate layman to pen a book to be used in the Bible, it is questionable to me at least how we can be so sure about something without knowing its source. It is the same reason i think it important to know the history behind so many other things said in the Bible, just so that you can understand why an author would say things the way they do. But, to argue the other side, the lack of an author requires us to trust more in the fact that God inspired all Scripture, regardless of whether we even know the author. As cheesy as it is to use, Paul says in 2 Timothy that “ALL scripture is God-breathed”, which includes books that we don’t know the author of. Think about the fact that there has never been an actual confirmation of who wrote the book of Genesis (though it is attributed to Moses), and yet it has been canon for as long as the Bible has existed. The implications of reading the letter as Pauline could be quite substantial, depending on your dispensational point of view. Contrary to what Dan said previously, the inclusion of Hebrews as a Pauline letter could have profound implications, especially for a mid-Acts dispensational view. This is mainly because in a mid-Acts dispensational theology, the Pauline epistles are the most directly applicable books of the Bible for today. Paul was writing for people in this current dispensation of Grace, and his writings are of utmost importance when discerning how to live right now. Mid-Acts dispensational theology generally brushes aside the general epistles as not fully applicable for today, and in my personal experience Hebrews often falls in that same boat. It is looked at for great theology and its well developed Christology, but rarely looked into for application for the present day when compared to Paul’s epistles. I feel like Ty touched on an important point when mentioning the implications of Pauline authorship as it relates to Mid-Acts Dispensationalism. Some today might give greater weight to the practicality of Hebrews if they view the book as being written by Paul, taking into account that Paul was charged by Jesus to be the primary witness of the Gospel to Gentiles. But one of the reasons that goes against this is the particularly Jewish bent Hebrews seems to have, which wouldn’t make sense if Paul was directing it toward Gentile Christians. The title of the book is, after all, Hebrews. While it might be possible Paul could have written it to the Jews as a sort of clarification that the fact of Jesus as God’s Messiah is rooted in the Old Testament, this doesn’t seem to line up with his overall mission of revealing the mystery of Gentile inclusion into God’s people. The ministry and writings to Jews are more prominently handled by apostles like John and Peter. For a few years now I’ve wanted someone to do an analysis of Hebrews in relation to Matthew’s Gospel, with a point of trying to see if there’s enough connective tissue between the two to propose Matthean authorship of Hebrews. The reason for this is that when I took the Jewish-Christian epistles class from Dale DeWitt he was talking about the structure of the letter being in an arrangement of alternating blocks of theology and exhortation. I immediately made the observation that this was not unlike how Matthew arranges his gospel in alternating blocks of Narrative and discourse. DeWitt seemed really surprised by the observation, but then moved on. I’ve wondered many times since then if this was simply a common structure to use by various authors or if it was Matthean. The chance seems to be an outside one, but it might make for an interesting paper. I am not sure that I have heard anyone try and make a case for Matthew as the author, probably because Matthew as an author is fairly well known and does not fit the “things we know about the author” that I mentioned before. Sometimes Matthew is described as a Jewish Christian mission text that is a kind of “Christianity without Paul;” certainly that as the later Ebionite view. I think that one reason is that Matthew is often associated with anti-pharisee polemic (chapter 23, for example, or the break with the pharisees in chapter 12). Hebrews is more positive toward the Temple, although you could say he is positive toward the Tabernacle and the “proper worship” from the OT, not the present Temple in Jerusalem or that priesthood. The alternation of blocks is intriguing, but the difference is that the exhortations in Hebrews are more brief, and “writer speaks to the reader” moments. Matthew is constructing an elaborate Moses typology, which may be a more fruitful way to come at the problem. An obvious problem will be Matthew’s complete lack of the Hellenistic / Platonic Jewish typology found in Hebrews (or even more so in Philo). But hey, everyone gets to argue for their own author for Hebrews! So get out there are prove your case, write a book, etc. I figured it was a long shot. Also it probably makes more sense to say that the “alternating blocks” thing was some kind of rhetorical method used by various people in many different contexts…not all of them Christian most likely. Thanks for the comment, Jeff. Been a while since I have heard from you, I always enjoyed having your kids at WCGYC. In my defense, I did not intend to cover all the possibilities. Just about everyone in the NT has been suggested at one point or another, the view that Peter and Silas wrote the book is in my classnotes, but under the heading “Extreme Minority Positions” (sorry!) As for your list, it is good, but check out the commentary by Paul Ellingworth in the NICGTC series if you can. He has a page of “real and significant” parallels between 1 Peter and Hebrews, although I think they are mostly drawn from an article from the Church Quarterly (1930-31) by T. E. S.Ferris, “A comparison of 1 Peter and Hebrews”. Ellingworth is unpersuaded since the comparisons are all the sorts of things one would expect from a Second Temple Jewish Christian writer. The list (in my view) confirms that the author was certainly a Hellenistic Jew, and that was in fact Peter’s target. Maybe Peter was the author, he is as likely as anybody. Concluding Paul’s authorship of Hebrews can be difficult after considering two areas of Pauline thought: Paul’s target audience and base message regarding salvation’s permanence. Paul is clear about the caliber of people he addresses for God’s work when he addresses those called to serve, “not many of you were wise by human standards, not many of you were influential, not many were of noble birth… God chose the lowly things of this world and the despised things – and the things that are not – to nullify the things that are…” (1 Cor 1:26-28). When considering the “highly literary and very ornate” (Jobes 39) Greek used to compose Hebrews, one can begin to doubt Paul’s personal authorship. Although well educated and a man of culture, Paul knew that God’s work was most often carried out by those with simple social status. Regarding the possibility of apostasy in Hebrews 6 & 10 causes greater concern of the authorship of Paul. Paul’s base message of salvation’s permanence is quite clear when he writes, “for God’s gifts and his call are irrevocable” (Rom 11:29). Although there are several similarities of Paul’s writing in Hebrews, based off his target working audience and his message of salvation, it is safest to assume the author of Hebrews was an individual highly influenced by Pauline teaching. Due to the fact that Hebrews does not introduce an author there are implications for the modern church. For me, is it hard to believe in a epistle that is anonymous? I would say yes and no. Yes it is hard to believe on the basic standpoint of how do we know that this is not a letter written by someone who has no worth? On the other hand, the author was certainly inspired when writing hebrews as the context of the epistle explains. However, just because Hebrews is believed to be anonymous it does not take away from the magnitude of the book. Whether Paul was the author or not there is information/inspiration that Hebrews has that no other N.T. book offers. First, “It is the book of the New Testament that is most devoted to explaining the relationship between the old covenant God made with ancient Israel and the new covenant established by the death of Jesus Christ” Secondly, “there is probably no other book of the New Testament that so clearly explains why the Christ had to be fully human in order to bring God’s redemptive plan to its culmination (4:14-15)”. Lastly, “the book of Hebrews explains the incentive for faithful living (Jobes, 2011). Ultimately, when reading the book of Hebrews one should not be so invested in knowing the author or not knowing the author. Moreover, as one reads the book of Hebrews they should be inspired and grateful for the content and context it presents. Jobes, K. H. (2011). Letters to the church: a survey of Hebrews and the General Epistles. Grand Rapids, Mich: Zondervan. I disagree with you from the standpoint of how do we know the letter was not written by someone who has no worth because even if that were to be true God works through anyone. He has worked through the poor all the way up to the wealthy. But a part of me thinks that this letter could be anonymous because for the most of letter did not match up with Paul’s style until the end. According to our book, “The style of Hebrews, except in the closing verses (13:18-25), is quite unlike any other writing of Paul’s that has survived, the author does not introduce himself as Paul typically did” (Jobes, 2011). However, another part of me still thinks Paul could have written it because it follows directly after Romans, which Paul did write, and he introduced himself in it. So, we could assume since Hebrews follows Romans maybe Paul did not need to introduce himself? Also, there are similarities between Hebrews and Romans. Hebrews 10:14 states, “For by one sacrifice he has made perfect forever those who are being made holy.” And Romans 5:9, 12:1 states, “Since we have now been justified by His blood”; “offer your bodies as a living sacrifice, holy and pleasing to God.” This shows how similar some of the parts of each book truly are. I am split just like you are as to whether or not Paul wrote Hebrews. There are many questions that could be asked because we do not have much evidence to conclude the true author of Hebrews. Thank you for sharing your thoughts, Jared! 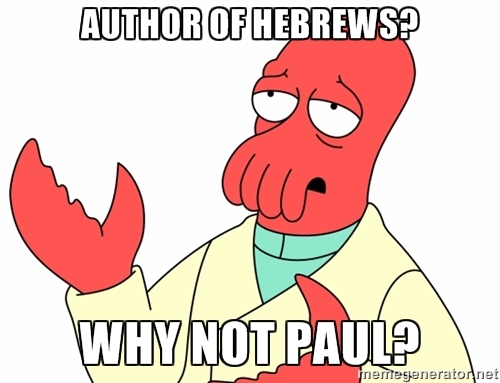 According to Karen Jobes’ portion of her book that discusses Hebrew’s author, makes me believe that the second centuries scholars were never really sold on the idea that Paul was the author. In Dr. Long’s original blog post, it says that there were second century theological fathers, such as Clement and Origen believed that Paul was the author. However, in Jobe’s book, Letters to the church, she states that even these early scholars associated the book with Paul, but wasn’t actually Paul psychically writing the book. (Jobe’s, p.37) Jobes’ also points out two additional evidences that Paul was not the author. Adam R. mentioned earlier that it isn’t until the closing of the book that the language of Hebrews is similar to Paul’s other letters, and Jobes’ supports this point. Secondly, Paul usually introduces himself at the beginning of his letters. Why all the sudden change pattern, if Paul were the author, as Hebrews has no author introduction at the beginning. Paul would also have to have changed pattern in his writing style if he were the author.